Following the first experience of Regard Benin, initiated in 2010 at the occasion of the 50th Anniversary Celebration of Independance by the Beninese Ministry of Culture, the Institut Français and the French Embassy in Benin, the project has become in 2012 a biennial. Biennale Benin, continuing the projects of several organizations and artists started in the country in 2010 as a collaborative event called “Regard Benin”. Among the initiators of the new biennial of contemporary art were the photographers Malick Sidibé, Antoine Tempé and Baudouin Mouanda, the artists Dominique Zinkpé, Aston, Gérard Quenum and William Wilson and the writer Florent Couao-Zotti. Benin presents a singular creation and a strong vitality in the sector of Visual arts from the point of view of artistic creation but also committed initiatives. The Benin artists such as Meschac Gaba, Georges Adeagbo or Romuald Hazoumé are present in the largest meeting of the international art scene as the Venice Biennale, the Documenta of Kassel and in 2012 in the Triennale of Paris. For a dozen years, artists, art critics and curators met together to undertake various training and promotion of the visual arts sector. The most striking example is probably the Zinsou Foundation. We can also mention the association and demonstration Ayizo Boulev’art, Tchif space, space Arttistik Benin and magazine Arttistik Afrika Cultural Centre Ouadada, House Heritage and Tourism Porto-Novo, Kulturforum, Laboratorio Contemporary Art, the Art critics Association, the association Elowa etc. The biennial is coordinated by the Consortium, a federation of three local associations – Unik lieu de création contemporaine, M3ribù agence d’ingénierie culturelle, Espace Tchif. The Consortium organizes Biennale Benin, in collaboration with other local cultural associations. The artistic speciality of Biennale Benin is based on the approximation of the artists with the public. Therefore one of the main issues of the Biennale is to question the public space. In addition to conventional exhibition spaces, the Biennale Benin explores unusual places of nearby cities. This choice is due to the current shortage of exhibition places existent in Benin but also and especially on the issue of the mobilization of the public – pursued since several years by cultural operators in Benin. Beyond its appearance as international event the Biennale Benin intends to participate in the structuring of visual arts. To do this, capacity building actions are envisaged to further empower industry players around specific skills such as curatorial, management and installation of exhibition, the art critic, the coaching careers of artists, cultural mediation. Eventually, the specialization in different professions attached to the implementation of the Biennale will form teams with varied skills, with the capacity to defend issues of creative commitment and actions undertaken in Benin and in the subregion. From November 8, 2012 to January 13, 2013, two contemporary art biennials centered on the exact same theme took place simultaneously in Benin. 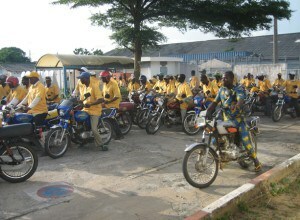 A biennial or two in Benin. By Cédric Vincent. Kulturforum Süd-Nord and The Biennale Regard Benin would like to thank the artists, partners and sponsors for their contributions. The Biennale Regard Benin: A Tea + ? in Venice. "Inventing the World" is the theme of the first official edition of the Biennale Regard Benin, which had informally premiered in June 2010 on the 50th Anniversary of Independence of the Republic of Benin. 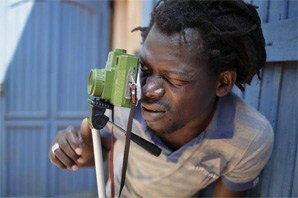 Opening this Week: Biennale Regard Benin 2012. Biennale Regard Bénin 2012: “Inventing World: The Artist as Citizen”. from 08 november 2012 to 13 january 2013. Abdallah Karroum Artistic Director of Biennale Benin. 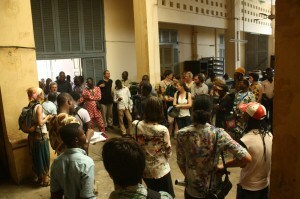 Regard Biennale Bénin 2012: “Inventing World: The Artist as Citizen”. from 8 november 2012 to 13 january 2013. 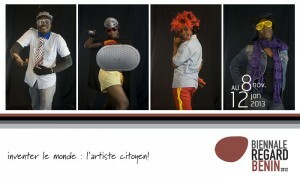 Regard Biennale Benin 2012: The Artist as Citizen. Biennale Benin, continuing the projects of several organizations and artists started in the country in 2010 as a collaborative event called "Regard Benin". 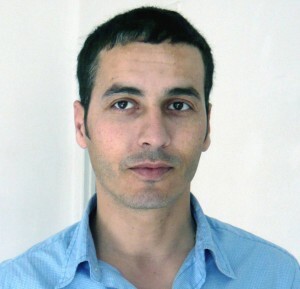 Abdellah Karroum curates Benin Biennale 2012.